Hamsters, in spite of its small size and dense body are characterised by a very restless nature and a thirst for adventure. So if you wind up this wonderful fluffy pet at home, you should know that the animal is not only very energetic running within the cage but also have a pronounced tendency to escape. Hamsters are very mobile animals. Besides being smart enough, some very quickly learn to open the cage door to get out of their cage. Moreover, these animals are so nimble and agile, which can hide even in the tiniest of spaces. 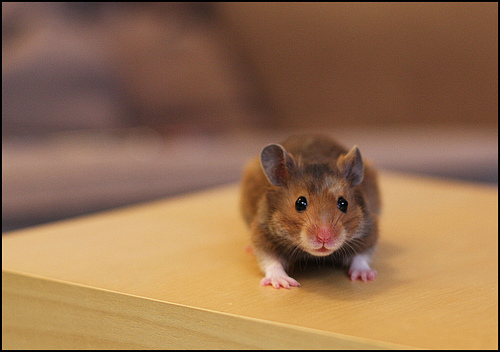 Finding a hamster in your apartment or home will not be difficult, keeping in mind the behaviour of the animal. It is important to know that these rodents are nocturnal. They are likely to hide somewhere in a secluded corner after escaping from their cage or aquarium in the afternoon. But late in the evening or at night, they forget about hiding and start running around the apartment in search of food. Pre-set some hamster feed and water somewhere in the house. Take a towel or a piece of tissue to catch this animal after sitting and waiting next to the food area. Immediately transfer it in the cage or aquarium. If the hamster is hid in a place and does not want to come out, you will have to find it yourself. It is not very easy, as these rodents are quite compact and can crawl through any crack. They love to hide in soft, warm and dark places. So it makes sense to look for a hamster in cabinets, shelves with clothes, under the bed and bed covers. Hamsters are not good at climbing but can reach a decent distance after clinging to the legs of any furniture with a cloth or cover. Inspect all around. If the hamster has been living with you for a long time, it is possible that it will get out of the shelter and return back to the cage sooner rather than later. However, if the animal has recently been acquired, you will have to conduct some detective work to find it. Gradually, the hamster gets used to the owners and ceases to hide. But if you let the animal run around, it is best not to leave it unattended as it can chew wallpaper, furniture and even taste the electric wires. Thus, it is better to keep a hamster at home in a spacious cage.